PrintBITS: Rick Plonski - Printing Concepts, Inc.
How did you get started in the printing industry? Can you discuss some of that? It all started when I was a newspaper delivery boy in grade school. I was fascinated by the whole “ink on paper” process and wanted to know how they did that. I went to Tech Memorial High School and chose graphic arts as my trade. In 11th grade went to work at a print shop (Bogart Business Forms) on a “Co-op program”. The rest is history. When did you know you wanted to get the printing and customer service industry? I spent about 15 years working at various production positions learning Letterpress typesetting, printing and die cutting processes. I was then given the opportunity to join the office staff as customer service, order entry, estimator and inside sales, having stayed in this role ever since. What do you think is the most interesting part of the printing business? Every day is a new adventure. You go from one project to another and you hope it stays that way. What do you find is the most common issue that clients deal with when talking to a printer? You do your best to understand the needs of the client. Good communications between client, yourself and our production staff is crucial. 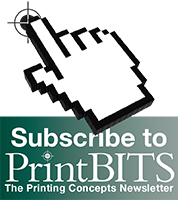 Where do you see the printing business going in the next five years? Good question. I never envisioned where we are at now just 5 years ago. Technology will keep evolving but I do believe there will always be needs for a hard paper copy. Do you participate in or watch any sports? Who is your favorite team? I try to golf when time, weather and finances line up. I follow all major college and professional sports. Have been an avid lifetime fan of major league baseball’s St. Louis Cardinals and I blame my wife’s family (who all mostly from Cleveland) for making me be a Browns fan. After work, what do you do first before anything else to unwind? Just look forward to being home. Enjoy the simple pleasures like lawn work and sitting on my back patio and watching the world go by. I would like to mention my 2 major accomplishments in my life. My married daughter Erica, who lives in Tampa, Fla., just gave birth to our first grandchild on June 6th. She delivered a healthy son whom they named Oliver. My son, Bryan, just graduated from Western Michigan University. My wife, of course, Marcy, has put up with me for nearly 33 years. How would you explain the printing industry for newcomers?